Proxima Centauri is the closest star (excepting the Sun) to Earth. It is a red dwarf a bit more than a tenth the mass of our Sun, and about four light years away. We don’t know if it has any planets, but that may change in a few years due to a fortunate alignment. The majority of exoplanets we’ve discovered has been in one of two ways. The first is known as the transit method. In this method a planet’s orbit is aligned so that it passes in front of its star on a regular basis. As it does so, it blocks some of the light coming from the star, making it appear dimmer. By observing the brightness of a star over time you can detect the regular dimming to determine the orbit and size of the planet. Of course this only works if the orbit is aligned just so. We’ve never observed such planetary transits with Proxima Centauri, so if it does have any planets their orbits aren’t in our line of sight. The other common method is known as the radial velocity method. This method uses the fact that a star with planets will wobble slightly. 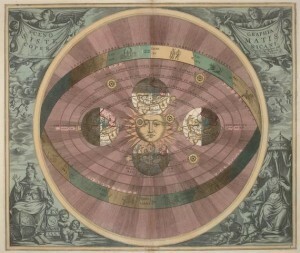 It is due to Newton’s third law of motion (action-reaction), so that as the star gravitationally pulls on a planet to keep it in orbit, the planet pulls back on the star. So as the planets orbit the star, the star wobbles slightly as a result. We can measure this wobble due to the Doppler effect of light. You’ve probably experienced the Doppler effect with sound, where a car or train horn sounds higher as its moving toward you and lower as it moves away from you. A similar effect occurs with light, so if a star is moving toward us, the starlight appears slightly more blue than we would expect, and if it is moving away from us it appears slightly more red. This effect is too small to see with our eyes, but we have instruments that can measure it. So if a star wobbles a bit, the color of its starlight will wobble a bit, redder and bluer. The more massive the planet, the more the star will wobble as a result, the effect is also larger for close planets, so it is easier to find large close planets than smaller or more distant ones. When we have observed Proxima Centauri, we haven’t seen any wobbling. Of course there is a limit to how precisely we can measure Proxima’s wobble. So the fact that we haven’t seen any wobble doesn’t mean there aren’t any planets, but it does mean it likely doesn’t have any Neptune-massed or larger planets any closer than Earth is from the Sun. Normally that would be it. If the planetary system isn’t in our line of sight, and there aren’t any large, close planets, then we would simply have to wait until we get better instruments to try finding planets around Proxima. But in a few years we will have the chance to use a different method, known as gravitational microlensing. Gravitational microlensing occurs when the light from a distant star is bent by the gravitational field of a closer star. When we observe a distant star directly, we only see the light that came from the star in our direction. But when a closer star lines up with a distant star from our point of view, the light of the distant star is bent slightly. The closer star focuses the light of the distant star, making the distant star appear a bit brighter for a while. The close star acts as a gravitational lens, hence the term. Now if the star has a planet, then the brightening of the background star won’t be uniform. Instead of a gradual brightening and dimming, you get the occasional spike in brightness, as you can see in the image above. By measuring these spikes you can determine the presence of planets orbiting the close star. 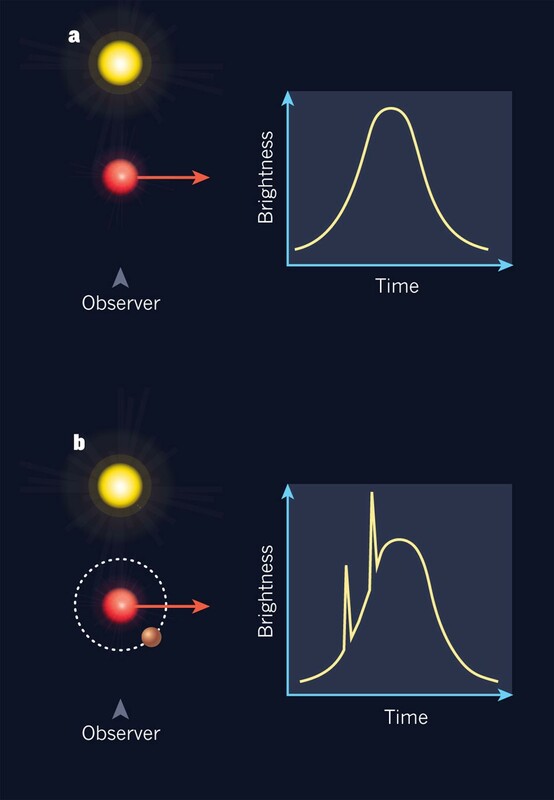 This only occurs when a close star aligns with a distant star from our vantage point, so detecting planets by gravitational microlensing isn’t a trick we can use very often. In fact, only 15 planets have been discovered in this way. 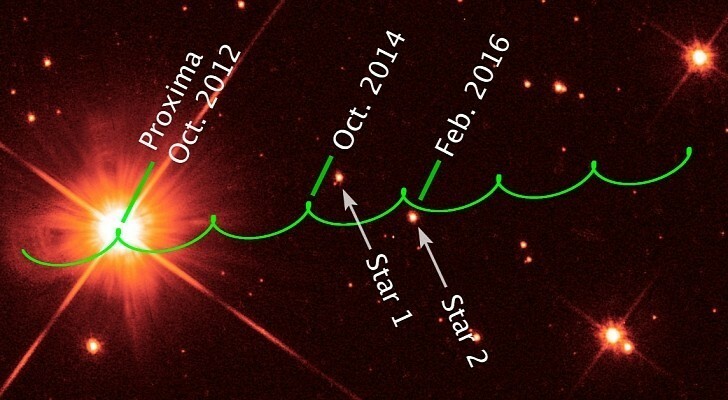 But in 2014 and again in 2016, Proxima Centauri will align close enough to a star for this method to be used. 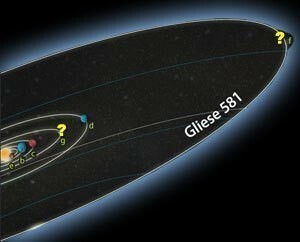 Then we’ll be able to determine if there are planets around our closest stellar neighbor.